Patrick Billingham looks at pad organisation and continues his look at playing outdoors. The Big Band@Brunswick schedule for the second half of the year is confirmed. No August fixture, but two in September. More details of these gigs will be provided in the gig guide for the month. As promised earlier in the year, I have started going to big band gigs elsewhere in the county, other than Brighton. Late April, I went to Tunes and Tea at Lindfield United Reform Church where The Perdido Swing Band were performing. The theme of the concert was a belated celebration of the centenary of the birth of Ella Fitzgerald, whose songs were ably covered by guest vocalist Jo Kimber. These were introduced by compère Peter Swann who kept the capacity audience entertained and informed. The non-vocal elements of the performance contained a wide spectrum of big band charts. There was some uncertainty as to whether Ellington’s In A Sentimental Mood should be played straight or swung. It was decided to play it straight this time and to swing it next time. What is the majority opinion as to how this tune should be played? Please let me know. If more than 52% decide a particular way, I shall publish the result. As well as giving the musicians the opportunity to play music they enjoy, the band performs to raise money for various charities. In this case the target was to pay for a month’s petrol for a community care nurse. At current prices, the money donated, should keep said nurse going for several thousand miles. By my reckoning, at least three months’ worth. Last month I discussed come of the problems associated with big bands playing al fresco. Some approaches are related to pad organisation, discussed in SJM64 (May 2017). Keeping the individual sheets in slippery fish (clear plastic punch pockets) in a ring binder, may well be a useful solution. Many vocalists with their own pads often use this system. Moving on to the next chart by turning the page. Even then, clips may be necessary to prevent the entire folder being blown away. And even in a light breeze, the open pages should be anchored to prevent them turning over. A major advantage of this method is that the printed charts are not only kept dry if it rains, but also protected from bird droppings. A major disadvantage is that reflected sunlight from the shiny plastic sometimes makes the music difficult to read. Where the charts are kept separately in a folder, much depends in the stand. There are three main types in big band use, illustrated in the photographs. If the band has big band stands with the band’s logo on the front, the music is more or less horizontal and the chart can be weighted down. On other types of stand, where, the music is nearly vertical, other techniques are needed. With a heavy duty stand, where the top is made from steel sheet, strong magnets are useful to keep the music in place. Magnets are not much use on lightweight folding stands, as the contact surface area is too small, so clamps, or that perennial stand-by, clothes pegs, must be used. A method which the SJO has found quite effective is to use A3 sized transparent Perspex sheets about 3mm thick. These hold the music in place, but still require clamping to secure them on the stand. For some years, my own preference has been a transparent A3 portfolio wallet. I take it with me whenever I play an outdoor gig, on whatever type of stand. This has several advantages. The charts to be played can be placed one behind the other in running order. Longer charts can be slid through, keeping the current page in clear view. And a chart that has been played can be tucked in one of the pockets behind, minimising changeover delay. There is to be more on this topic later. Where the possibility is discussed that technology may come to the rescue by making the above solutions obsolete. Next month: Hopefully more news about big bands based in, or appearing in, the county, and perhaps another band profile. If you would like your band featured, and I have not already contacted you, please get in touch. Or if there is anything else, such as gig news, or feedback on this column, that you would like me to include in July’s Big Band Scene, please send it to me by Saturday June 23rd. My email address is g8aac@yahoo.co.uk. 7:30 pm, Brighton Festival Fringe: Livin’ Larger Than Life; The South London Jazz Orchestra at St. Nicholas of Myra Church, Church St. off Dyke Road, Brighton, BN1 3LJ, (07944 344108). £12/£8. [R] 12:00 – 2:00 pm, The Sussex Jazz Orchestra celebrating Corpus Christi Sunday and the launch of the public consultation for the City Parks St. Nicholas’ Green Spaces Conservation Management Plan at St. Nicholas of Myra Church, Church St. off Dyke Road, Brighton, BN1 3LJ, (07944 344108). Free entry. 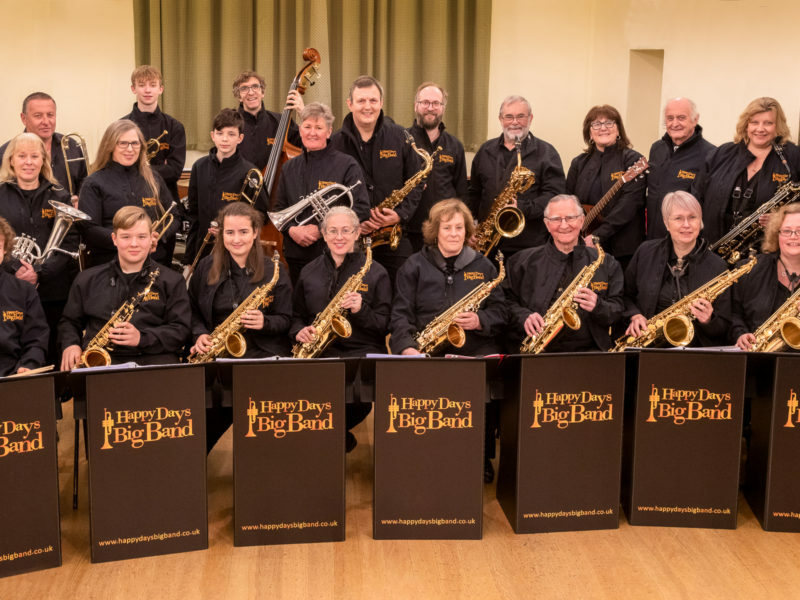 [R] 12:45 – 3:00 pm, Sounds of Swing Big Band at The Horseshoe Inn Hotel, Posey Green, Windmill Hill, Herstmonceux, East Sussex BN27 4RU (02035 645225). Free entry. 8:00 – 10:30 pm, Big Band @Brunswick: The Brighton Big Band with Dave Williams at The Brunswick, 3, Holland Road, Hove BN3 1JF (01273 733984). Free entry with collection. [R] 8:00 – 10:30 pm, The Rox Sessions Live at ‘The Hoff’: Bognor Regis Big Band open rehearsal at the Hothampton Arms, London Road, Bognor Regis, West Sussex, Brighton PO21 1PR, (01243 821434). Free entry with collection for the Rox music charity. [R] 8:00 – 10:30 pm, The Ronnie Smith Big Band at The Humming Bird Restaurant, Main Terminal Building, Shoreham Airport, West Sussex, BN43 5FF (01273 452300). Free entry with collection. 1:00 pm, Tiger Arts: The Perdido Swing Band at Lindfield United Reformed Church, 50 High Street, Lindfield, West Sussex, RH16 2HL. Free entry with soup and roll beforehand. 7:30 pm, The Big Chris Barber Band at The Hawth, Hawth Avenue, Crawley, West Sussex RH10 6YZ (01293 553636). £22. 1:00 – 3:00 pm, The Wacky Band at The Bexhill Music Festival, De La Warr Pavilion, Marina, Bexhill, East Sussex TN40 1DP (01424 229111). Free entry. 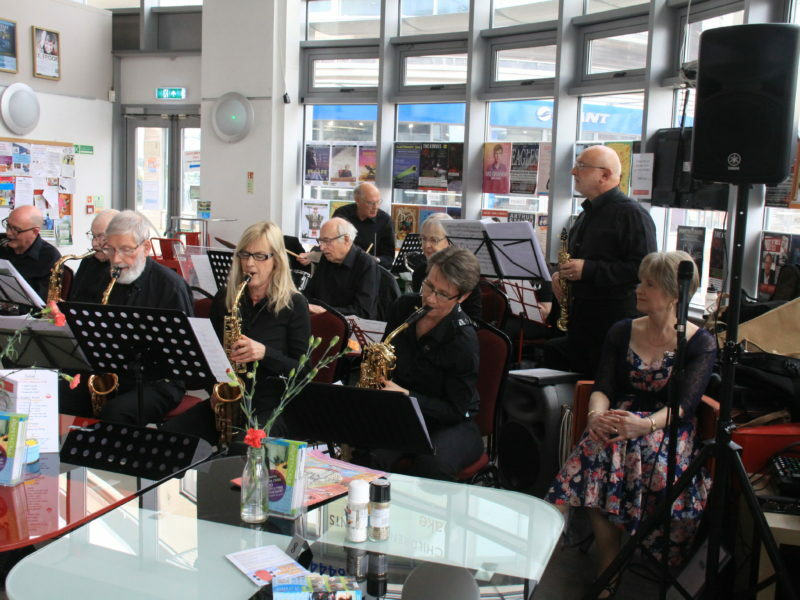 2:00 – 4:00 pm, The Sussex Jazz Orchestra at the Pavilion Gardens, New Road Brighton, BN1 1 UG (01273 730712), weather permitting. Free entry. 8:00 pm, Terry Pack’s Bonsai at The Jailhouse, Duke’s Path, off High Street, Arundel, West Sussex BN18 9AP (01903 889821), £10. 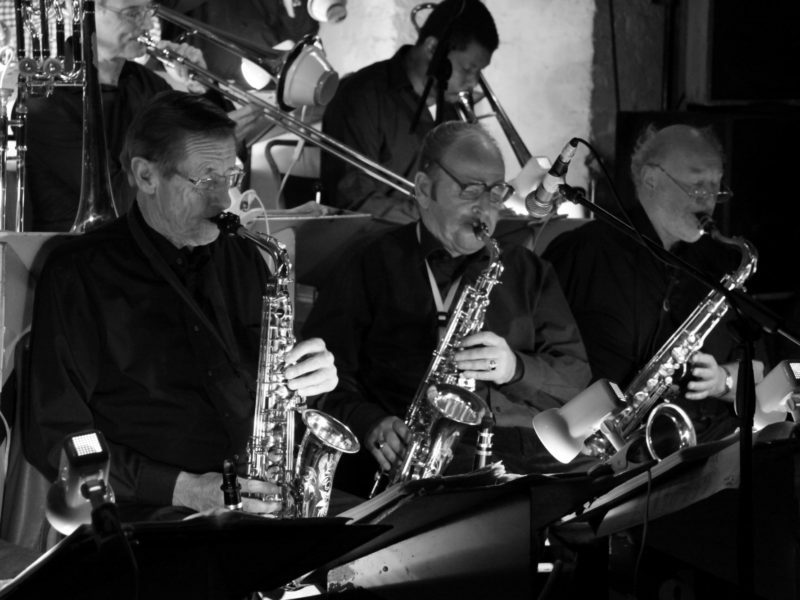 8:30 – 11:00 pm, The Woburn Jazz Big Band at The Verdict, 159, Edward Street, Brighton BN2 0JB (01273 674847), £10/£5. 7:30 – 10:00 pm, Big Band @Brunswick: Terry Pack’s Trees at The Brunswick, 3, Holland Road, Hove BN3 1JF (01273 733984). Free entry with collection. 8:00 – 9:30 pm, Big Band Sound 01: The Swingshift Big Band on Eastbourne Bandstand, Grand Parade, Eastbourne, East Sussex BN21 3AD. Advance bookings (01323 410611) £5/£2.50, or on the night £7/£3.50.